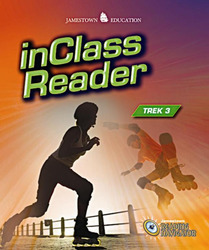 Jamestown Reading Navigator's inClass Readers allow students to choose from a wide range of high-interest selections to promote independent reading. These books may be used with the Jamestown Reading Navigator online program or independently. -Nonfiction and fiction selections represent a wide variety of genres and provide content-area reading practice. -Side-margin notes help students to monitor reading comprehension and apply reading skills and strategies. -End-of-selection questions and Literature Circle activities encourage students to reflect upon unit themes and to relate selections to their own lives in a collaborative learning environment. -Selection quizzes measure comprehension, reading skills and strategies, allowing teachers to monitor student progress.